I usually come up with a general idea and/or design and allow my materials, mood, and mistakes to guide me to the completion of a piece. Using an intuitive technique, I use free-form peyote, brick stitch and others to create flowing artworks or asymmetrical designs. My main love is seed beads, both in structured and intuitive beadwork. 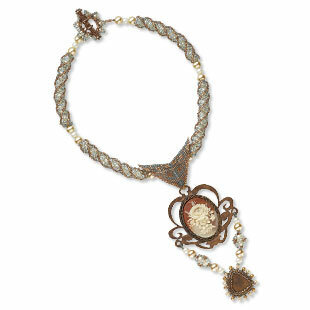 Accent beads are merely resting places for the eye to stop while enjoying the movement of the seed beads. I am most proud of my beaded art doll entitled Drops of Jupiter. I created her during the summer of 2007 just before my entry into college. I based her off the song of the same name by Train and interpreted the theme to be change and personal growth. I even wrote a short story to accompany the piece. 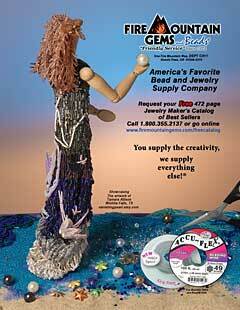 Drops of Jupiter appeared on the back cover advertisement for the 2009 summer issue of Art Doll Magazine. Three years of entering Fire Mountain Gems' competitions finally paid off. I feel more than honored. There are no words to describe the joy you feel when you turn the magazine around and start jumping from the excitement of seeing your piece and name in print. At the age of 13, I spent one week at a friend's house. Her mother instructed us to clean her room. We found a beading loom under the bed. Let's suffice it to say that the room was never cleaned and that my life has never been the same. I didn't discover Fire Mountain Gems until about age 15. That was about the same time that I discovered the existence of beading magazines. Advertising works miracles I guess. Fire Mountain is the ultimate source for my spur-of-the-moment projects! Jewelry-making is the drive behind my educational experience. If beads were not a part of my life, I would never have found the desire to become an art major in college (now with teacher certification). At the end of a stressful day, or those times of inactivity between school and work, beadwork is stress relief from my busy life. 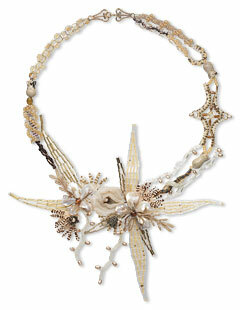 If I had the option, I would immerse myself in beads and work to my heart's content. 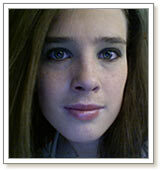 View all of Tamara's designs in the Gallery of Designs.